This cache is placed near the main path along the length of the island which was the only way from 5BC until recent years when the road was built from one end to the other. From the location of the cache is a view of the island of Nikouria and just around the corner is the view of the watchtower Richti. 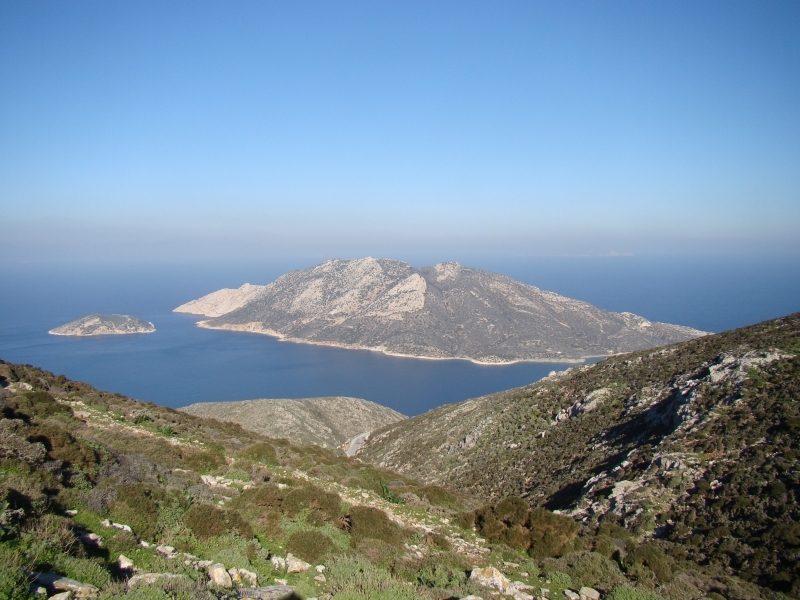 The island of Nikouria is geologically different to Amorgos being related to the islands of Naxos, Paros and Donoussa. The peak of the island is 346 metres high and is called Halara (not to be confused with walk 5). There are three beaches and in the summer small boats take people across from Agios Pavlos. In the third century BC the island was inhabited, with fortifications, a sanctuary and a mint producing the coinage for the three city-states. In more modern times, up until the late 19th century, Nikouria was used as a leper colony; the remains of the houses still being visible from the mainland. The chapel on Nikouria is called Panagia and behind it can be seen the ruins of the accommodation used by the monks who looked after the lepers. Supplies for the monks and lepers were transported by boat from the spit of Agios Pavlos to the edge of Nikouria and thrown across to the people. Today the island still belongs to the monastery and is used by the islanders as common grazing for their goats. The most prominent feature at Richti is the ruined circular Hellenistic watchtower. This tower would have been used for defence as well as for lookout and warning purposes. Torches and fires would have been used to send signals to the surrounding areas in the event of an attack and the people would have fled into the mountains. The cache is in a plastic drink container with a red top. It just contains a log and a geocaching declaration in Greek and in English. Please take a pen with you. Additional Hint: A dry place for goats to shelter.